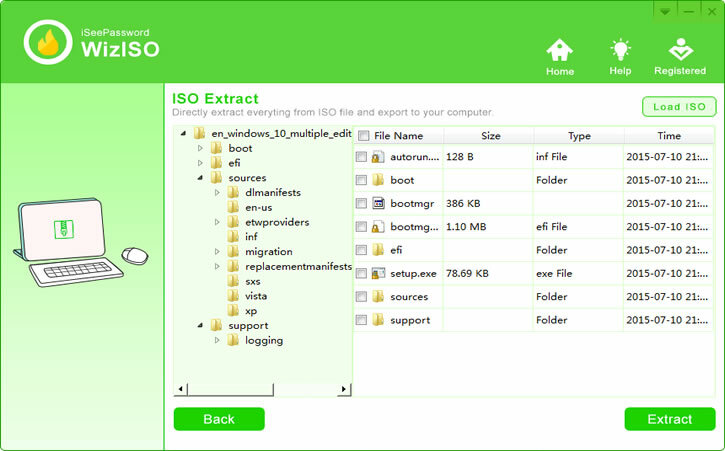 Looking for a all in one ISO file management tool which can seamlessly create, extract, edit, copy or burn ISO files easily? Well, here's WizISO from iSeePassword, a cross platform software runs on both Windows and Mac. Now we'll take a dig inside the WizISO software to see how actually it works and how smoothly it performs on Windows platform. Let's get started. Truly this software packs most of the basic utilities needed to create, manipulate and burn an ISO file. The user interface is simple and clear, runs on two major OS platform, Windows 10 and mac OS. Some of the core features are listed below. Integrated with 5 functions: Burn, Extract, Create, Edit and Copy Disc. Easily burn ISO to DVD/CD and USB drive. Directly open the ISO file and extract everything from ISO to your computer. Copy ISO Image from DVD/CD to computer. The only downside is, some features are not available with the trial version. Installing the WizISO is as easy and straight forward as installing any other software on Windows. Just download the WizISO installer file, then double click over it to start the installation process. You've to accept the licence agreement. As an optional, you might also want to create a desktop shortcut, that option is also present in the installer. After installing, you can run the software immediately, or use the desktop shortcut created previously to launch it whenever needed. The interface looks like below, pretty simple and intuitive. As you've already noticed in the above screenshot, there's 5 main option to play with ISO files. The Extract and Edit operations are pretty straight forward, just select the ISO file you want to extract, select the destination to extract and you're pretty much done with it. Though DVD/CD drives are almost obsolete now, copying a DVD is not very rare. With WizISO, copying a DVD is also very very simple. After inserting the disk, you just have to select the proper DVD drive, then select the ISO format and and the file saving location, finally hit the Start button to copy the disc. Creating a bootable USB with WizISO is also damn simple. Almost anyone with anyone with basic computer knowledge can create a winodws 10 bootable USB drive or DVD disc. The very first option is to select the ISO file you want to use. This ISO file is preferably of any operating system installation file, not a music or video ISO file, as we're making a bootable media. The next option is to select whether you want to create a bootable USB or a bootable DVD. For testing purpose, I've selected the second option to create a bootable USB. Then you've to select the USB device, the one you want to make bootable. Be very careful at this step. As choosing the wrong drive or partition could be disastrous. The USB device will be formatted, so better take a backup if anything important left inside. Now it's time to select the partition type , select GPT if you're planning to boot the OS in pure UEFI mode. Else select the MBR partition scheme, which works on both UEFI or legacy BIOS based systems. With the MBR partitioon type, you could even format the drive to NTFS filesystem. You might also want to set a name for the USB drive, which is not necessary, anyway I've decided to give it a familiar name. After setting everything up, hit the Burn button. If everything was done right, the process should start without any error. The process is going to take some time, mostly depending on the size of ISO file you're using and the write speed of the USB flash drive. Well, that's all for this review. In my opinion, it's a nifty tool to have. Very useful if you've to deal with many ISO files daily. Though all the functionalities could be achieved by using other individual applications, but this all-in-one approach totally justifies the premium price tag. And that also won't be as easy as using this tool. So, hope you've enjoyed this review, also don't forget to give the free version a try.